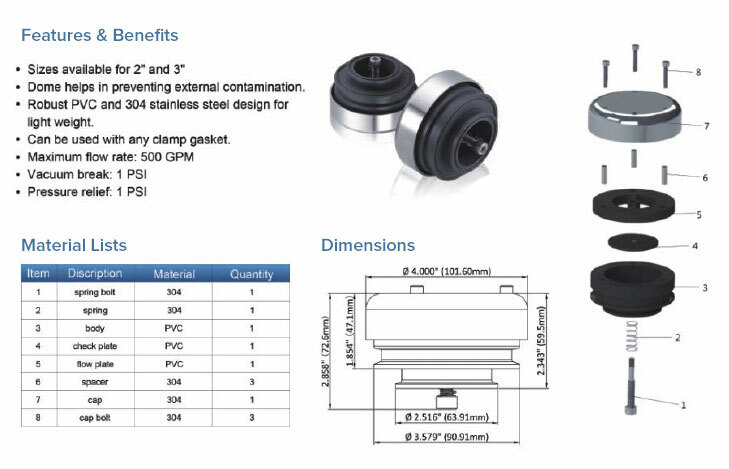 Sanitary Solutions is your Beverage, Brewery, Winery and Tank Industry source for a 2" or 3" clamp connection vacuum & air relief tank vent valve in T304. When Sanitary Solutions 2" or 3" Clamp Connection Vacuum & Air Relief Tank Vent Valves are installed on your vessel or tank before you begin, then you begin emptying the vessel thus reducing VACUUM as the fluid level drops. As we turn to the pressure side of the tank or vessel, our 2"/ 3" Clamp Connection Vacuum & Air Relief Tank Vent Valves are in place and as you begin to fill the vessel, PRESSURE will be reduced as the fluid level rises. 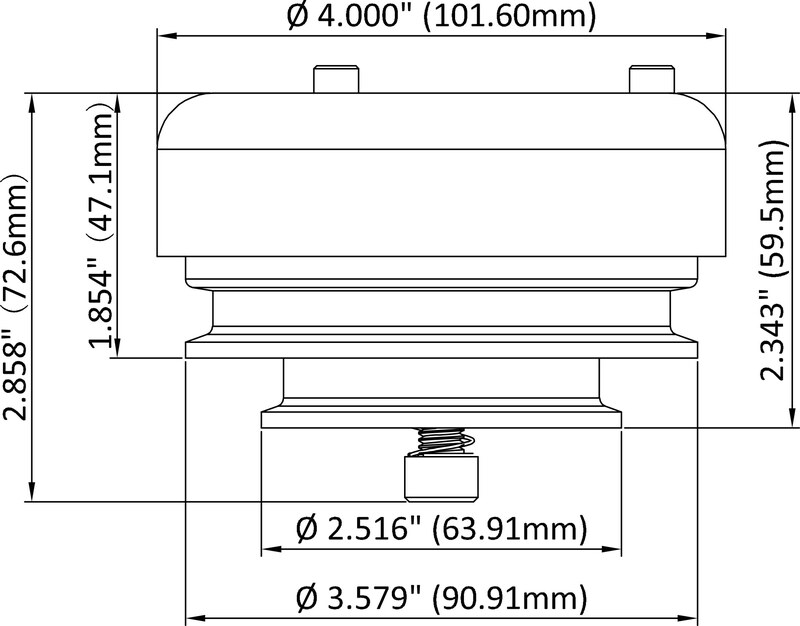 As for installation of the 2"/ 3" Clamp Connection Vacuum & Air Relief Tank Vent Valves, position the valve on either a 2" or 3" process line and fasten the clamp according to the fastening system selected and if you are using the clamp style it is recommended to use a clamp gasket and tighten the wing nut of the Heavy Duty Single Pin Clamp to 25 inch pounds of torque. ADVANTAGE: This valve will accept EITHER a 2" or 3" clamp connection. This Valve has been set at 1 psi (pressure) and 1 psi (vacuum) and can not be changed. 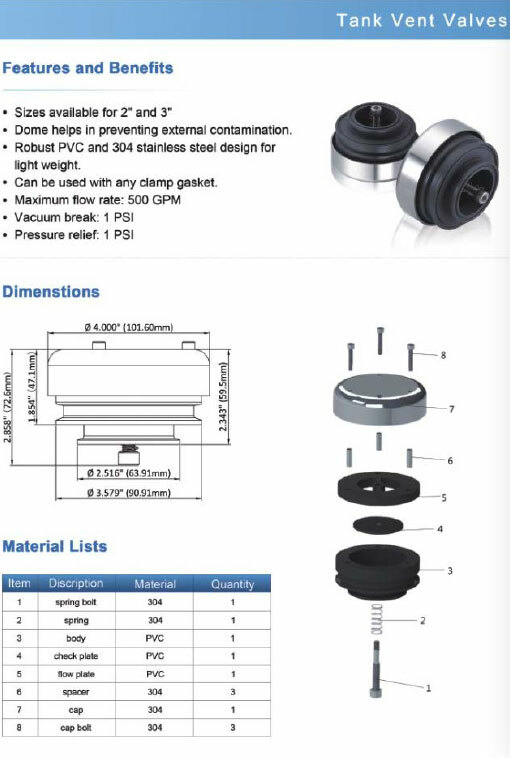 When the need arises for a 2"/3" Clamp Connection Vacuum & Air Relief Tank Vent Valve, please call us Toll Free at 1-888-909-3569 or 1-855-640-7871 as we stock the above valve to accept a 2" or 3" Clamp style.